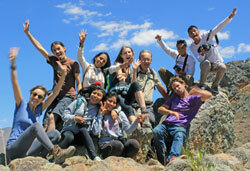 The FairMail Peru team has just returned from an epic photography trip into the Northern Andes. In the area around the northern capital of the former Inca empire the teenagers travelled together with a group of Italian, American and Dutch photography enthusiasts looking for the best images of local beauty. This 4-minute video gives a good impression of their visit to former Inca ruins, waterfalls, thermal baths and an authentic bull market. Click here if you want to travel with the locals too and join us on one of our next photography trips.